This tablet commemorates the discovery of gold-bearing quartz and the beginning of quartz mining in California. 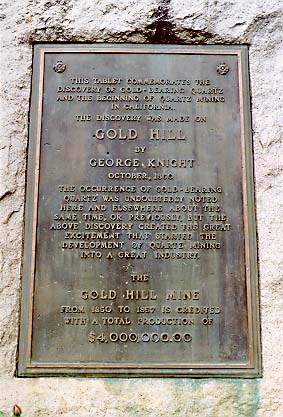 The discovery was made on Gold Hill by George Knight, October, 1850. The occurrence of gold-bearing quartz was undoubtedly noted here and elsewhere about the same time, or previously, but the above discovery created the great excitement that started the development of quartz mining into a great industry. The Gold Hill Mine from 1850 to 1857 is credited with a total production of $4,000,000.00. SW corner of Jenkins St and Hocking Ave, Grass Valley.